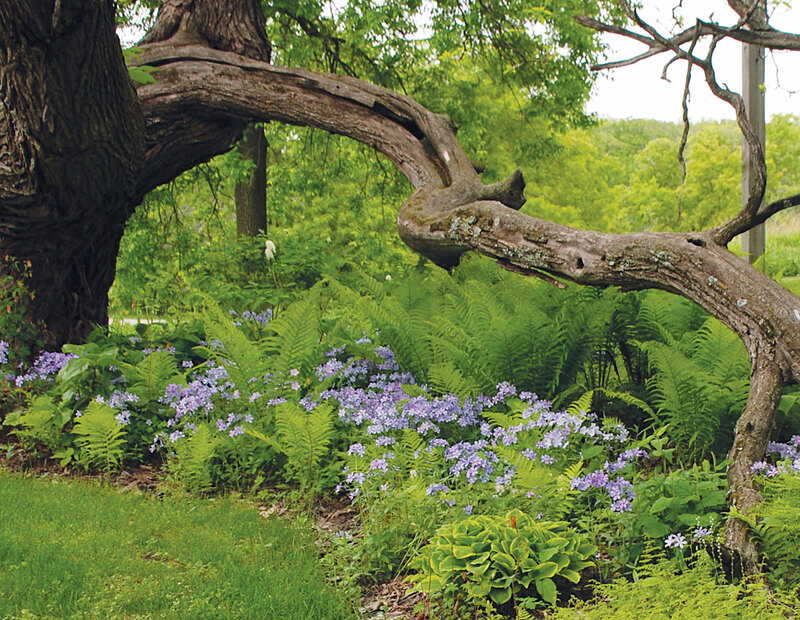 Steiner has now written several books focused on her horticultural specialty, including Grow Native: Bringing Natural Beauty to Your Garden and Landscaping with Native Plants of Minnesota. Naturally, she also grows many native plants in the gardens that surround her home in Stillwater. She and her husband have lived in their 1898 farmhouse since 1985. Over time they have planted many different sections of their nearly 18-acre property, which includes perennial and vegetable gardens, as well as a prairie, woodland, and savanna, with a mix of native and non-native plants. Steiner’s favorite spot, the entry garden, was inspired by walled gardens she once saw on a garden tour in Charleston, South Carolina. “I liked the small spaces enclosed by brick walls, and I wondered how I could do that,” she says. Her solution was twofold. First, she added a garage next to the house to create two walls, and then a cedar fence with a custom-built arbor to give the space the feeling of enclosure that she wanted. 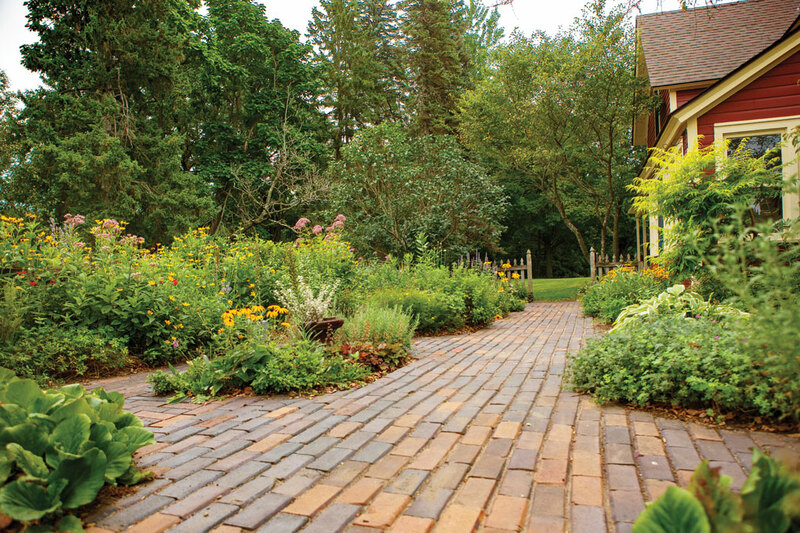 Bricks from the St. Paul Stockyards were repurposed to create a path through part of the charming garden, which includes small trees, shrubs, and perennials, as well as herbs. That said, Steiner does make a point of choosing the pure species of natives as often as possible, but there are instances where cultivars (cultivated varieties) of native plants are a better option because they have been specifically bred with positive attributes like a longer flowering period, less of a tendency to sucker, or better form. In talks she gives to gardening groups, Steiner often uses New England aster as an example, pointing out that the pure native species is tall, gangly, and often in need of support while native cultivars like ‘Purple Dome’ and ‘Hella Lacy’ are more compact while still having all the characteristics that attract pollinators. 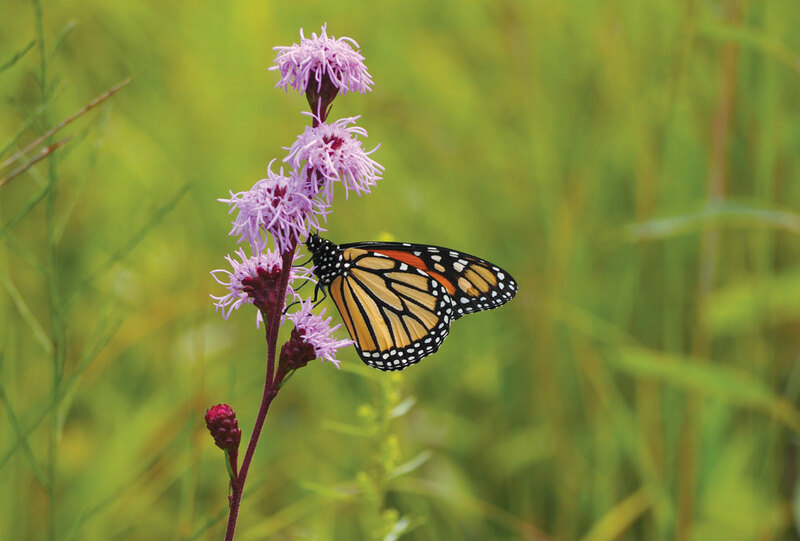 Steiner’s prairie-restoration garden is the one place where she grows pure species of natives only because the whole idea is to restore what would have grown there naturally. Located in front of the house along the driveway, the prairie-restoration garden was installed and is maintained by Princeton-based Prairie Restorations. Built from a small remnant of prairie by the road, the garden started with a seed mix and a few plant plugs after the land had been burned and cleared. Some of the prairie’s many plants include oxeye daisy, anise hyssop, prairie dropseed, big blue stem, little blue stem, wild bergamot, liatris, and goldenrod. Also in front of the house is the woodland garden, which grows beneath a partially fallen Northern catalpa tree that’s probably been around since the house was built, Steiner figures. “It’s a North American native, though it’s not a tree that’s native to Minnesota. It has weathered so many winters even though it’s been damaged several times,” she says, explaining that the tree has become a sculptural piece in the front yard. Like most woodland gardens, this one is most spectacular in spring when early blooming natives such as trillium, bloodroot, Virginia bluebells, and woodland phlox are in bloom. Once they die back, a variety of natives and cultivars take their place, including shade-tolerant zigzag goldenrod, ferns, wild ginger, hostas, baneberries, and Jack-in-the-Pulpit. Meleah Maynard is a Minneapolis-based journalist, editor and Hennepin County Master Gardener. Her book, Decoding Gardening Advice: the Science Behind the 100 Most Common Recommendations, was co-authored with Jeff Gilman and published by Timber Press in 2011. She blogs at livinthing.com.